The process of making small batch refrigerator jam is incredibly easy, quick, and versatile for any fruit or flavor combination. Use this base recipe to make strawberry, raspberry, blueberry, blackberry, peach, or numerous other flavor combinations of jam! This basic recipe for refrigerator jam is a template to use for any favorite fruit jam combination! This recipe works well with both fresh or frozen fruit and makes a small batch meant to be stored in the refrigerator or freezer. Quick jam is essentially fool proof. Add any kind of spices, herbs, or zests you like to create your own unique creation! Create a new small batch jam every few weeks to keep your toast interesting! This recipe is for a small batch of refrigerator jam. The process is easy, quick, versatile for any fruit or flavor combination, and is made without pectin. Use this base recipe to make strawberry, raspberry, blueberry, blackberry, peach, or numerous other flavor combinations of jam! Prep the fruit by washing it and removing any stems or peels if applicable. Roughly chop the fruit up into large chunks. Raspberries, blackberries, and blueberries can all remain whole. In a saucepan (at least 2 quarts in size) combine all of the ingredients and heat over medium heat. Mash the fruit and sugar with a potato masher or a fork. It does not need to be completely mashed, depending on how chunky you like your jam. Bring the mixture to a boil and cook over medium heat, stirring occasionally, for about 20 minutes, or until the juices thicken. It will become much more thick as the jam cools. 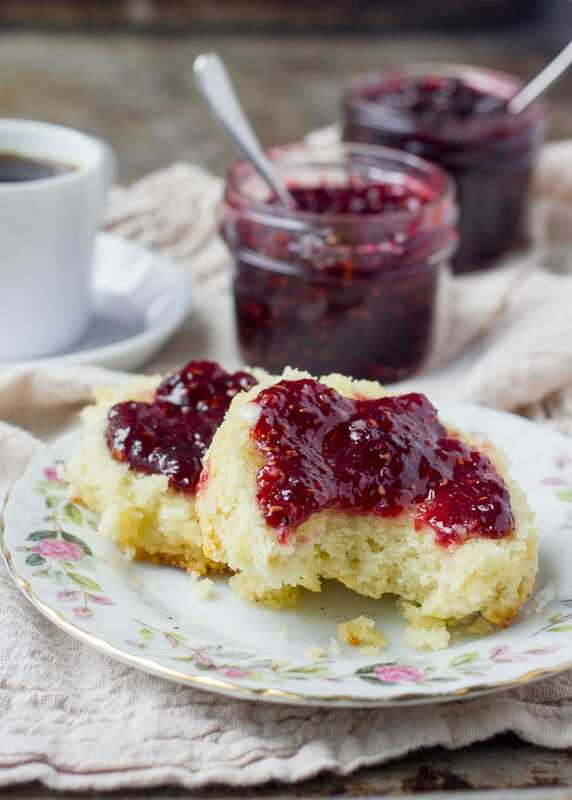 If this is your first time making this and you are a little unsure if your jam is cooked enough to set, spoon a little bit of jam onto a saucer and place it in the freezer for about 2 minutes, or until it is cold. Touch the jam and if it has a gelatinous jammy consistency it is ready. If not, continue cooking. Cool completely then store in an airtight container or jar in the refrigerator for up to 3 weeks or in the freezer for up to 4 months. When freezing, be sure to leave enough room at the top of the container to allow the jam to expand when frozen. The amount of sugar can be reduced by up to 1/2 cup (3.5 oz, 98 gr) depending on your preferences for sweet. Note that reducing the sugar will require the jam to be cooked slightly longer in order to thicken. All images and text ©Baker Bettie. Be careful not to overcook the fruit during this process. The mixture will seem too thin, but will thicken up as it cools. Boiling sugar is incredibly hot. Use caution when stirring to not splatter the mixture. If you want to add some fresh herbs into your jam, such as basil, mint, or thyme, do it during the last few minutes of the cooking process to retain their bright flavor. Sugar: The sugar and the liquid from the fruit are coming together to make a syrup. As the fruit cooks, the moisture begins to evaporate the sugar syrup will thicken. Lemon Juice: In addition to adding some flavor, the acidity of lemon juice helps the pectin naturally released from the fruit to set. This gives it the jam consistency. Ha! This is pretty much exactly what I do. I love making small batch jams because I don’t have access to the abundance of fruit to make large batches cost effective. It’s so much better than whatever the store has to offer. Even in winter with organic strawberries at $8/lb, still better. On another note, I can’t wait for the Superbowl…..for the food of course. I think I’m going to try your pretzels to go along with some “party” food I’m making. I’ll let you know how they turn out! It’s such a great way to make some quick jam isn’t it?! Please do let me know how you like the pretzels! Thanks for this. I took my toddler for a program at our local library and they made jam. 1 cup strawberries, 1/4 cup sugar, and 1 tablespoon of pectin. But I like this one don’t have to hunt pectin down and lemon juice is a pantry staple…of course the trade off is having to cook it but worth it. They used a Ziploc bag to smash the strawberries and then mixed pectin/sugar then added to strawberries and smashed them more. It was so good! I’ve never liked jam especially without peanut butter but homemade I can eat alone. Your recipes are great I have tried the rosemary snickerdoodle cookie and the spicy chocolate cookie yummm! Thanks so much for this recipe! I just recently got hooked on a blueberry preserve that’s very hard to find. I cannot wait to have my little 4 and 9 year old granddaughters help me make this! We love your recipes! Seems like you read my mind…everything I think about making….bam…there you are with the recipe, lol. You need your own show! Awe, thank you, Micki! I’m so glad my recipes are hitting the bullseye 😉 Enjoy baking with your granddaughters! Love simple recipes like this, and that it doesn’t use pectin! YES! Total win/win! Thanks, girl. How many cups of fruit equals one pound needed for this recipe? Different fruits vary in size greatly therefore I cannot give one volume measurement because it depends on what type of fruit you are using and the size it is. For instance a pound of blueberries will be about 3 1/4 cups while a pound of halved strawberries could be about 4 cups depending on how big they are. Looking to make this as gifts for my husband’s office staff. How much jam does this recipe yield? Hi Lisa, one batch of this will yield 12 fl oz. Keep in mind that this method does not make a shelf stable jam. It will need to be refrigerated or frozen! Enjoy!